Send your Footsteps to the Moon for Free. At Lunar Mission One, we believe the Moon is for everyone. It’s our driving force, our core belief, our mission. We want to give everyone on Earth the chance to make their mark on the Moon with us. So upload a photo of your footprints, feet or shoes below. We plan to send all your photos to the Moon on the Astrobotic Lander in 2017, so you can make a stand on the Moon with us. Lunar Mission One is a mission to the Moon for everyone. Image types: png, jpg, jpeg or gif accepted up to 5MB in size. File names with punctuation (!&. :; etc.) will not be automatically viewable in the gallery. Once uploaded your image will normally be viewable in the gallery within a few minutes. The Digital Memory Box you bought during the Kickstarter is only valid for the 2024 Lunar Mission One mission to the Moon. You can however buy a Digital Memory Box for the 2017 mission and have the value of your purchase added to your 2024 Digital Memory Box value. The values are not the same as it is still many years away from the 2024 mission and who knows what compression tools and data storage mechanisms will be available to carry your data on the Lunar Mission One mission. So for now we can only give you the data allowances for the 2017 Digital Memory Boxes and not the 2024 mission. You can use the digi.me software to collate your Digital Memory Box at any time or it can be re-assigned to any nominated party. All we need is whoever has power of attorney of your will to notify us of the details of your digi.me account or who you have nominated as the new owner of your Digital Memory Box. Your hair carries a sample of your DNA, which shows how diverse humans are. However, it is inert and is not made up of living cells and cannot be bought back to life. Lunar Mission One believes the Moon is for everyone and wants to give everyone on Earth the opportunity to make their mark on the Moon, digitally of course. The “Footsteps on the Moon” campaign aims to encourage people all over the world to come and "stand" on the Moon together by uploading a photo of their footprints, feet or shoes to be digitized and sent to the Moon in 2017 for free. Whatever their story, everyone will be able to share their precious moments - their new-born’s feet, their shoes on their wedding day, footprints in the sand on their honeymoon. It’s critical that every country is represented on the Moon, so we want to find footsteps from Earth’s 195 countries. The campaign is the second phase of an initiative designed to harness the world's passion for space and use it to support a scientific mission in 2024 to better understand how the Moon and the Earth were formed, assess the suitability for a permanent lunar base, leave an epic record of life on Earth as an archive...and democratize space exploration in the process! Everyone will also be given the opportunity to support the 2024 LM1 mission through purchasing a “digital memory box” to store their personal pieces of history in the digital archive, including photographs, stories, videos or music, which will also be sent to the Moon in 2017 aboard the Astrobotic Lander. The purchase will also freely reserve space in the 2024 archive. In 2024, we plan to send an unmanned robotic spacecraft to the South Pole of the Moon to better understand how the Moon and the Earth were formed, assess the suitability for a permanent lunar base, leave an epic record of life on Earth as an archive...and democratize space exploration in the process! We appreciate that 2024 is a long way off! However, we want to ensure the safest possible landing for our experiments and our archives in 2024. Therefore, in 2017 we are supporting the technology testing aspects of Astrobotic’s Lunar mission to win the main Google Lunar XPRIZE (for sending a remote lander and rover to the Moon). As part of this mission, we want to give everyone the opportunity to make their mark on the Moon as their first "step" towards their participation in Lunar Mission One. While much of the support for the project so far has come from space enthusiasts, who engage with the scientific and technological aims, the ingredient that has given Lunar Mission One such a broad appeal is the archive we intend to place into the Moon. There is an untapped popular interest in space, well beyond the space sector. People are drawn towards the notion of reserving their own space. It is intrinsically human to imagine our own future, and indeed that of our planet, as well as the legacy we would look to leave behind. Many people embrace the idea of having a part of them live on after they are gone, and it is a wonderful thing to imagine the archive’s discovery long into the future. The “Footsteps on the Moon” campaign is just the very beginning for people to create their own private archive and the opportunity to make their mark on the Moon, which, according to The United Nations Outer Space Treaty, belongs to all of us. The campaign is another “step” towards our ambitions for the most exciting space project since Apollo. Each new supporter we gain adds to our momentum. Everyone will be able to upload an image of their footprints, feet or shoes to the Footsteps on the Moon microsite, which will then be digitized by our partner Digi-Me and sent to the Moon upon the Astrobotic Lander in 2017. They can send their image to the moon for free as part of the Footsteps on the Moon campaign. 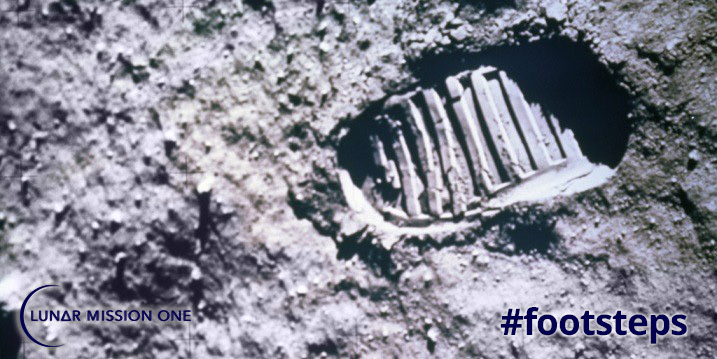 You can submit as many images as you like of your footsteps, feet or shoes for the Footsteps on the Moon promotion through the approved Lunar Mission One channels. No image submitted should be over 1MB in size. The Lunar Mission One team reserves the right not to accept images that do not comply with the above entry requirements. Images accepted will be compressed into a single data file and sent to the Moon aboard the planned Astrobotic Ltd Mission in 2017. Should this mission not proceed, Lunar Mission One will make every effort to find an alternative supplier. Each entrant must undertake that the image submitted is of his or her own origination, and that they hold all moral and intellectual property rights to the image. By submitting your image the entrant accepts that any visual representations of their work can be displayed in any of Lunar Mission One’s or associated partner’s social media channels and may be used for promotional purposes during and after the promotion. Unless express permission is given from the entrant, any work used by LM1, will be used anonymously.